Insite Solutions (DBA Stop-Painting.com) announces the recent issue of U.S. Patent No. 10,214,664 to inventor and managing company director Cliff Lowe. The patent covers the proprietary design of the company’s Superior Mark® Floor Tape, specifically its beveled edge that allows industrial traffic to slide up and over the tape, rather than scrape up under the tape and cause damage and uplifting. What makes Superior Mark® Floor Tape worthy of a patent? InSite Solutions began the application process for this patent in 2004. Many industrial facilities use floor tape to provide outlines for work areas, pedestrian or mobile machinery paths and other visual cues to increase employee safety and productivity. Most floor tape has a flat 90-degree edge that makes it easy to be scraped up with normal heavy industrial traffic. Superior Mark® Floor Tape’s patent claims it’s angled, or “beveled” edge limits damage to the tape and thus the need to replace it as often as other tapes. Insite Solutions currently has five patents in its patent portfolio, all relating to the design of industrial floor or pavement marking products. InSite Solutions manufactures Superior Mark® Floor Tape in its Wake Forest facility and sells its products throughout the U.S., primarily through an e-commerce site. Stop-painting.com is the industry leader for floor and pavement marking products and safety signs. They research, design and manufacture many of the products they sell. 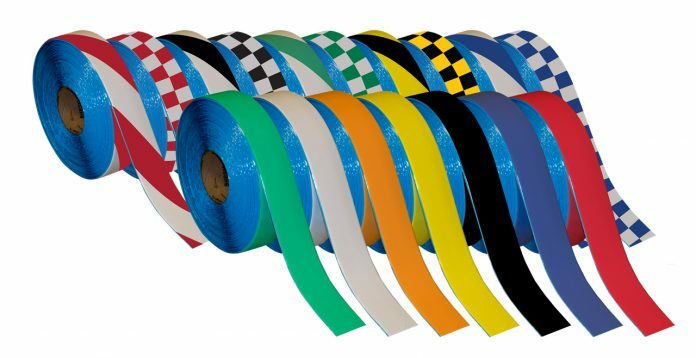 The company’s vast inventory of products includes rolls of tape, footsteps, pallet corner markers, directional arrows and many more visual cues that increase workplace safety and productivity. For more information, visit www.stop-painting.com.